Continuous high beams 1. Turn the ignition key to position II. 2. With the light switch in position , (see page 67) pull the turn signal lever toward the steering wheel to toggle between high and low beams. 2. Pull the turn signal lever to position (3). The high beams will remain on until the lever is released. When leaving your vehicle at night, home safe lighting can illuminate the area in front of the vehicle. 1. Remove the key from the ignition switch. 2. Pull the turn signal lever as far as possible toward the steering wheel and release it. 3. Exit the vehicle and lock the doors. The headlights and parking lights will illuminate and remain on for 301, 60 or 90 seconds. 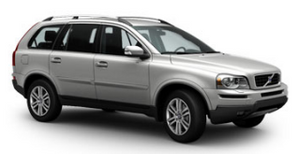 The time interval can be changed by a trained and qualified Volvo service technician.